Pole vaulting, a part of track and field, is a rigorous and demanding athletic event in which a person uses a long, flexible pole (which today are usually made either of fiberglass or carbon fiber) as an aid to leap over a bar. Pole jumping competitions date back to the ancient Greeks, as well as the Cretans and Celts. It has been a full medal event at the Olympic Games since the Summer Olympics of 1896 (for men) and since the Summer Olympics of 2000 for women. Pole vaulting is a dangerous and sophisticated sport requiring a high degree of both athletic skill and mind and body co-ordination. Poles were used as a practical means of passing over natural obstacles in places such as the marshy provinces of Friesland in The Netherlands, along the North Sea, and the great level of the Fens of Cambridgeshire, Huntingdonshire, Lincolnshire and Norfolk. The artificial draining of these marshes created a network of open drains or canals intersecting each other at right angles. In order to cross these without getting wet, while avoiding tedious roundabout journeys over bridges, a stack of jumping poles were kept at every house and used for vaulting over the canals. In Friesland, where it is called fierljeppen, it has continued to be a folkloristic activity with annual competitions. The sport originated in the form of the "Broad-jumping"; however, it has never found its way into organized athletics as the high jump is the only form that is officially recognized. In the Canary Islands, a folk sport known as salto del pastor was once used for transport over dangerous mountain terrain by aboriginal populations; today it is a recreational activity superficially resembling pole vaulting. Modern competitions probably began around 1850 in Germany, when vaulting was added to the gymnastic exercises of the Turner by Johann C. F. GutsMuths and Frederich L. Jahn. 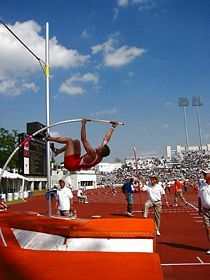 The modern pole vaulting technique was developed in the United States at the end of the nineteenth century. In Great Britain, it was first practiced at the Caledonian Games. Initially, vaulting poles were made from stiff materials such as bamboo or aluminum; later, the introduction of flexible vaulting poles made from composites such as fiberglass or carbon fiber allowed vaulters to achieve new heights. Physical attributes such as speed and agility are essential to pole vaulting effectively, but technical skill is an equally if not more important element. The object of pole vaulting is to clear a bar or stick supported upon two uprights without knocking it down. Competitive pole vaulting began with bamboo poles. As there is an increase in height, the bamboo poles give way to tubular steel, which was tapered at each end. Today's pole vaulters benefit from poles produced by wrapping sheets of fiberglass around a pole mandrel (pattern), to produce a slightly pre-bent pole that bends more easily under the compression caused by an athlete's take-off. Different fiberglass types, including carbon-fiber, are used to give poles specific characteristics intended to promote higher jumps. In recent years, carbon fiber has been added to the commonly used E-glass and S-glass prepreg materials in order to create a pole with a lighter carry weight. As in the high jump, the landing area was originally a heap of sawdust or sand where athletes landed on their feet. With the advancement in technology, vaults were performed at a higher level. As a result, the sawdust mats evolved into bags of large chunks of foam. Today's high tech mats are solid pieces of foam usually 1-1.5 meters thick. Mats are growing larger in area as well, in order to minimize any risk of injury. The proper landing technique is on the back or shoulders; however, landing on the feet must be trained out of the athlete, to eliminate the risk of spraining or breaking an ankle. The pole vault crossbar has evolved from a triangular aluminum bar to a round fiberglass bar with rubber ends. Today, athletes compete in the pole vault as one of the four jumping events in track and field. It is also the eighth event in the decathlon. During a competition, a bar progression is chosen by an event official. The progression goes from an initial height, called the opening height, presumably a height that all competitors are capable of clearing, and progresses higher by even increments. Typical increments are six inches in American high school competitions, or 10 to 15 cm in collegiate and elite competitions. Competitors can enter the competition at any point in the progression. Once the competitor enters at a certain height, he or she has three attempts to clear the bar. If the vaulter clears, even if the vaulter missed one of his attempts, he or she gets three attempts at the next height. At any point in the competition, a vaulter may decide to pass on a height and come in at a higher one. If a vaulter has used any attempts on the height he or she decided to pass, those attempts count toward the greater height, so he or she has fewer attempts on the greater height. A "no height," often denoted NH, refers to the failure of a vaulter to clear any bar during the competition. Having cleared the highest height, the last competitor remaining in the competition wins. Vaulters are placed first, second and so forth according to their highest cleared height and the number of attempts that were taken to clear that height. A tie can occur when two or more vaulters have the same number of misses at every height. Ties can be broken in what is known as a jump-off. A jump-off is a sudden death competition in which both vaulters attempt the same height, starting with the last attempted height. If both vaulters miss, the bar goes down by a small increment, and if both clear, the bar goes up by a small increment. A jump-off ends when one vaulter clears and the other misses. In Britain, at one time, the vaulter was allowed to climb the pole when it was at a perpendicular level. Tom Ray, of Ulverston in Cumbria, who was champion of the world in 1887, was able to gain several feet in this manner. However, this method is now illegal and if the vaulter's grip moves above his top hand after takeoff, the vault is marked as a miss. 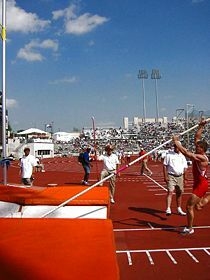 The equipment and rules for pole vaulting are similar to the high jump. Unlike the high jump, however, the athlete in the vault has the ability to select the horizontal position of the bar before each jump and can place it between 0 and 80 cm beyond the back of the box, the metal pit that the pole is placed into immediately before takeoff. If the pole used by the athlete dislodges the bar from the uprights a foul attempt is ruled, even if the athlete himself has cleared the height. There is an exception to this, if the vaulter is vaulting outdoors, and has made a clear effort to throw the pole back, but the wind has blown it into the bar then it would still count as a clearance. If the pole breaks during the execution of a vault, the competitor will be allowed another attempt. There are many physical, psychological, and environmental factors that can contribute to the success or failure of an attempt, including speed, technique, height, jumping ability, strength, confidence and mental preparedness, wind speed and direction, temperature, etc. 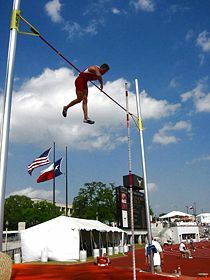 The vaulter must choose a pole with length and stiffness that is matched to his ability, which may vary according to the above conditions. The mere act of choosing a pole can have a significant effect on a vaulter's jump, as a pole that is too elastic will cause the vaulter to penetrate too far into the pit, sometimes flying underneath the bar before achieving maximum height, and a pole that is too stiff can cause the vaulter to be rejected backwards, in extreme cases landing back on the runway or in the box. Poles are manufactured with ratings corresponding to the vaulter's recommended maximum weight. Some organizations forbid vaulters to use poles geared below their weight as a safety precaution. Though this rule is supposed to make pole-vaulting less dangerous, it is an inconvenience to the athletes and in some cases it can actually make the sport even more dangerous. The recommended weight corresponds to a flex rating that is determined by the manufacturer by placing a standardized amount of stress on the pole and measuring how much the center of the pole is displaced. Therefore, two poles rated at the same weight are not necessarily of the same stiffness. Since pole stiffness and length are important factors to a vaulter's performance, it is not uncommon for an elite vaulter to carry as many as 10 poles to a competition. The effective properties of a pole can be changed by gripping the pole higher or lower in relation to the top of the pole. The left and right hand grips are typically about shoulder width apart. Poles are manufactured for people of all skill levels, with sizes as small as 10 feet, 90 lb, to as large as 17+ feet, 230 pounds. Although there are many techniques used by vaulters at various skill levels to clear the bar, the generally accepted technical model can be broken down into several phases, listed and described below. The approach consists of the vaulter sprinting down the runway in such a way as to achieve maximum speed and correct take-off position upon reaching the pit. 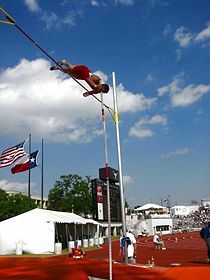 The pole is usually carried upright to some degree at the beginning of the approach, then gradually lowered as the vaulter gets closer to the pit. By doing this the vaulter can use the potential energy stored from carrying the pole upright to his advantage. It is common for vaulters to use long, powerful strides at the beginning of the approach, then accelerate by increasing stride frequency while maintaining the same stride length. Unlike short sprinting events such as the 100 m in which a forward lean is used to accelerate, vaulters maintain an upright torso position throughout the approach because staying as tall as possible is important to the next phase of the vault. The plant and take off is initiated typically three steps out from the final step. Vaulters (usually) will count their steps backwards from their starting point to the box only counting the steps taken on the left foot (vice-versa for left handers) except for the second step from the box, which is taken by the right foot. For example, a vaulter on a "ten count" (referring to the number of counted steps from the starting point to the box) would count backwards from ten, only counting the steps taken with the left foot, until the last three steps taken and both feet are counted as three, two, one. These last three steps are normally quicker than the previous strides and are referred to as the "turn-over." The goal of this phase is to efficiently translate the kinetic energy accumulated from the approach into potential energy stored by the elasticity of the pole, and to gain as much initial vertical height as possible by jumping off the ground. The plant starts with the vaulter raising his arms up from around the hips or mid-torso until they are fully outstretched above his head, with the right arm extended directly above the head and the left arm extended perpendicular to the pole (vice-versa for left handed vaulters). At the same time, the vaulter is dropping the pole tip into the box. On the final step, the vaulter jumps off the trail leg which should always remain straight and then drives the front knee forward. As the pole slides into the back of the box the pole begins to bend and the vaulter continues up and forward, leaving the trail leg angled down and behind him. The swing and row simply consists of the vaulter swinging his trail leg forward and rowing his arms down, while trying to keep both arms and left leg as straight as possible. Effectively, this causes a double pendulum motion, with the top of the pole moving forward and pivoting from the box, while the vaulter acts as a second pendulum pivoting from the right hand. This action results in even more potential energy being stored in the pole, all of which will be returned to the vaulter in later phases. The swing continues until the hands are near the shins and feet of the vaulter, with the vaulter facing upward in a curled position. The curled position is also known as "the basket" and is generally held slightly longer when trying to attain higher heights. Another form of swing is called the double leg drop. After executing a normal take-off, the vaulter lets his lead leg drop and swings with both legs together. In doing this, the weight of the vaulter's lower body is centered further from his rotational axis, making it more difficult for the vaulter to swing with as great a speed as with a single legged swing. For the same reason, a vaulter with constant rotational speed will load the pole with more energy using a double-legged swing than a single legged swing. Because the slower swing can make it more difficult for a vaulter to get in position for the rockback, the double leg drop is typically not taught as the conventional method. A successful double-leg drop is exemplified by French vaulter, Jean Galfione. A third form of swing is called the tuck and shoot. This is accomplished by tucking both legs in toward the chest rather than leaving the trail leg extended. This has the opposite effect of the double leg drop; it shortens the lower body about the rotational axis, making the swing faster, but lessening the pole-loading effect of the swing. Because a shorter rotational axis can make it more difficult to use larger poles than with a longer axis, the tuck and shoot is also not considered the conventional method. A successful tuck and shoot is exemplified by American record-holder, Jeff Hartwig. The extension refers to the extension of the hips upward with outstretched legs as the shoulders drive down, causing the vaulter to be positioned upside down. This position is often referred to as "inversion." While this phase is executed, the pole begins to recoil, propelling the vaulter quickly upward. The hands of the vaulter remain close to his body as they move from the shins back to the region around the hips and upper torso. The turn is executed immediately after or even during the end of the rockback. As the name implies, the vaulter turns 180° toward the pole while extending the arms down past the head and shoulders. 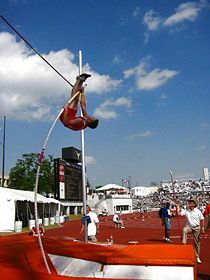 Typically the vaulter will begin to angle his body toward the bar as the turn is executed, although ideally the vaulter will remain as vertical as possible. A more accurate description of this phase of the vault may be "the spin" because the vaulter spins around an imaginary axis from head to toe. This is often highly emphasized by spectators and novice vaulters, but it is arguably the easiest phase of the vault and is a result of proper execution of previous phases. This phase mainly consists of the vaulter pushing off of the pole and releasing it so it falls away from the bar and mats. As his body goes over and around the bar, the vaulter is facing the bar. Rotation of the body over the bar occurs naturally, and the vaulter's main concern is making sure that his arms, face and any other appendages do not knock the bar off as he goes over. The vaulter should land near the middle of the foam landing mats, or pits, face up. 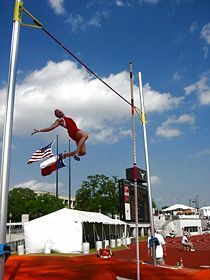 The pole vault is exciting to watch because of the extreme heights reached by competitors, and the inherent danger of the activity, two elements which combine to make it popular with spectators. The issue of safety has been prevalent from the outset of the sport's existence. In fact, many have claimed that pole-vaulting itself is a health hazard, and can result not only in life-altering injuries, but death. High schools and colleges have been canceling the pole vault from competitions because of the perceived danger. While the concept of helmets to protect the head and neck areas during the athelete's landing is reasonable, some fear that the helmet may in fact cause more danger. With a helmet, the impact could be magnified, and even for a perfect landing, could result in trauma to the brain. Box: A trapezoidal indentation in the ground with a metal or fiberglass covering at the end of the runway in which vaulters "plant" their pole. The back wall of the box is nearly vertical and is approximately 8 inches in depth. The bottom of the box gradually slopes upward approximately 3-feet until it is level with the runway. The covering in the box ensures the pole will slide to the back of the box without catching on anything. The covering's lip overlaps onto the runway and ensures a smooth transition from all-weather surface so a pole being planted does not catch on the box. Grip: This is where the vaulter's top hand is on the pole. As the vaulter improves his grip may move up the pole incrementally. The other hand is typically placed shoulder-width down from the top hand. Hands are not allowed to grip the very top of the pole (their hand perpendicular to the pole) for safety reasons. Plant position: This is the position a vaulter is in the moment the pole reaches the back of the box and the vaulter begins his vault. His arms are fully extended and his drive knee begins to come up as he jumps. Volzing: A method of holding or pushing the bar back onto the pegs while jumping over a height. This takes amazing skill, however it is now against the rules and counted as a miss. The technique is named after U.S. Olympian Dave Volz, who made an artform of the practice and surprised many by making the U.S. Olympic team in 1996. The so-called "6 meters club," which consists of pole vaulters who have reached at least 6 meters (converts to 19 ft. 8 1/4 inch) is very prestigious. In 1985 Sergei Bubka became the first pole vaulter to clear 6 meters; he also holds the current outdoor world record at 6.14 metres, set on 31 July 1994 in Sestriere. All "6 meters club" members are men. The only woman to exceed 5 meters is Russian women's world-record holder Yelena Isinbayeva, who reached that height in 2005 and broke her own record that same year with 5.01 meters. ↑ USA Pole Vault Education Initiative Retrieved December 22, 2007. ↑ Calculator for official mark conversions in athletic events, hosted by USATF.org. Retrieved December 22, 2007. This page was last modified on 9 May 2015, at 16:14.